When using your new Apple Macbook, you’ll find it hard to plug your USB memory stick or LAN cable for internet connection, as there is only 1 USB Type-C connector. UNITEK’s Y-3083B brings you the solution! 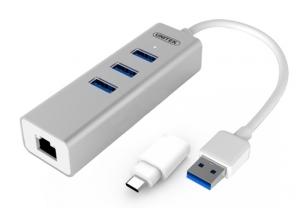 With 3x USB 3.0 ports and a Gigabit Ethernet port, it’s a compulsory accessory for your new Apple MacBook. Equipped with USB 3.0 and Gigabit Ethernet, it’s the strongest combination which provides high-speed data transfer (up to 5GBPS) and Gigabit Ethernet connection. The aluminium case matches the style of your Apple MacBook too. This product is not only for new Apple MacBook. Just take out the USB Type-C adaptor, it’s a widely used USB Type-A connector. It brings you the convenience of switching between USB Type-A and Type-C connector.